There is an ongoing fight, just north of Düsseldorf, Germany, to save the Hambach Forest, Germany's last old growth forest. The forest is a 1,000 hectare old growth oak forest right next to the largest open cast coal mine in Europe. The mine is 12 kilometers long, 4 kilometers wide, and 300 meters deep. The mine produces 100,000,000 tons of coal per year, used to supply 5 power plants. The coal is used primarily for the weapons manufacturing industry in the nearby Rhineland industrial district. The mine is set to operate until 2045. The forest was acquired in 1978 by RWE, which now operates the mine. The forest was originally 5,500 hectares and since 1972 had been owned by the municipality of Niederzier. Since 1978 the forest has largely been cleared to make way for brown coal mining. The company has also been using a law that the Nazis used to take land from people to evict people from entire villages. Over a ten year period this relocation process has removed entire village populations and demolished the structures to mine the coal underneath. During the relocation process some elders have died due to the stress and heartbreak of losing their homes. Many people are coming down with cancers, heart disease, and emphysema from airborne toxic particles. The remaining forest, despite its dramatic diminution, is still a functioning habitat. It consists primarily of oak and hornbeam, who shelter endangered Bechstein's bats. An ongoing blockade has been in place since April 2012 to save this remnant forest. 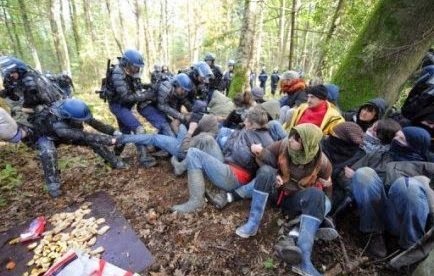 The blockade was evicted from the forest in November 2012, but after only one day they regrouped and occupied a meadow next to the forest. In April 2013 they reoccupied the forest. More recent actions included a treesit in a 250 year old oak at the edge of the forest, a group of Earth First! members blocking the loading of coal trucks, and a protest in nearby Bergheim against a newly built coal burning plant. The struggle continues to save the Hambach Forest. For slides, videos, and more information on past actions and on the current blockade, visit Hambach Forest (English) or Hambacher Forst (German). If you can physically help with the blockade, please join them in person. You can also donate money through their website. Whatever you can do would be really appreciated. Time is running out for this place; the final showdown for this forest will probably happen by August 2015. Thank you for your interest and support to save this beautiful place. New ebook: "100 Daily Affirmations for Revolutionary Proletarian Militants"
Stephanie McMillan has a new ebook available for downloading, for $2.99: “100 Daily Affirmations for Revolutionary Proletarian Militants”. 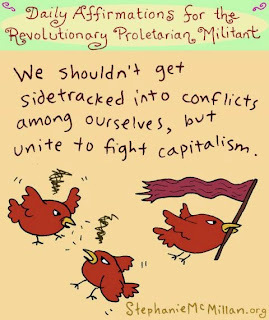 The ebook is a collection of hints of encouragement for those who want to destroy global capitalism, paired with cute drawings. You can also view all the Affirmations at Stephane McMillan's website for free, but you may like having a collection all in one place, and buying the ebook is a great way to support her work! Sabotage against industrial machinery (itself responsible for murder of actual living and breathing humans and non-humans) is "violence"
In fact, civil disobedience or anything else that breaks their rules to challenge their power is "violence"
Amongst others named or hinted at as threats are Deep Green Resistance New York, Zoe Blunt of Forest Action Network, and the Unis'tot'en Camp. all operating as aboveground, not criminal, organizations. Michael Toledano wrote an excellent article for Vice, including quotes from interviews with many of the activists highlighted in the report. He ties the leaked RCMP paper into proposed Bill C-51, which would drastically ramp up law enforcement powers, allowing a "preventive" seven day detainment of those who "may" commit a violent crime. How helpful of the RCMP report to clarify that anyone opposing industry is part of an unpredictably violent movement! Tolenado contrasts this chilling official perspective with his own first-hand experiences reporting on protest actions in Canada. "Now when push comes to shove we'll find out exactly how repressive and violent this government is. They are the ones who are violent. They're the ones who are criminals. They're the ones willing to destroy ecosystems, habitats, watersheds. They're the ones who are willing to put our entire coastline at risk, and everything that depends on this landscape, everything that depends on these ecosystems is put at risk when they put these projects through. "They're looking at civil war. If they want these pipelines they're going to get it over our dead bodies." Mike Stasse at Damn the Matrix has posted a short analysis of the latest incarnation of the oft-repeated claim that we can generate all the electricity we "need" from a relatively small area of desert. Proponents of such claims rarely acknowledge that those deserts are habitat ― that is, home ― for many creatures. 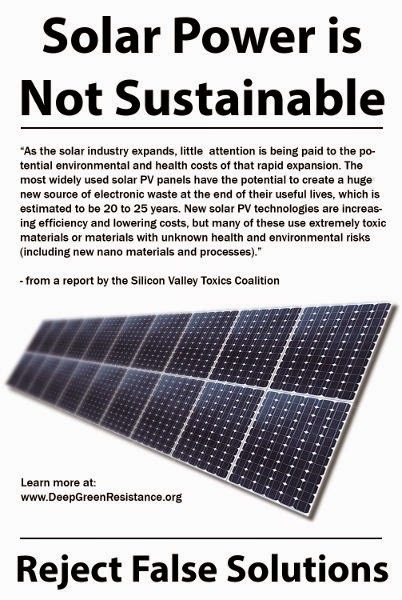 And as Stasse points out, the mining required to produce a solar farm causes tremendous harm. We recently highlighted Will Falk's account as one of the Deep Green Resistance volunteers who braved the January snow and ice to help out at the Unist'ot'en Camp. Max Wilbert wrote another moving personal piece giving an overview of the Unist'ot'en Camp strategy and describing the experience of contributing to their struggle. Snow lashed the road. The darkness was total, our headlights casting weak yellow beams into the darkness. Most people had hunkered down in homes and motels, and the roads were near empty. Still, every few minutes a passing truck threw a blinding cloud of dry snow into the air, leaving us blind for seconds at a time as we hurtled onwards at the fastest speeds we could manage. We pressed on, for our destination was important. It was a caravan to the Unist'ot’en Camp, and we were committed. Resistance is the antipode to the dominant culture, and the Unist’ot’en Camp illustrates two interlocking and fundamental truths. First, the system which is killing the planet and exploiting billions can and must be stopped. Second, resistance is our best chance of reclaiming the best traits our species can display: compassion, love, fierce loyalty, deep connection to the land, community and shared purpose. Read Wilbert's essay at Deep Green Resistance Seattle: Falling in Love and let it inspire you to support the Camp or another strategic campaign near and dear to you.